Wande Coal Shuts Down His Sold Out Show As Wizkid Makes An Appearance | IkoroduVibes | Exporting Africa Entertainment..
Wande Coal gave an electrifying performance at his first ever headline Uk show, Wande Coal live in concert .The show took place at the Indigo at The O2 Arena on Sunday November 11, 2018. Wande Coal and some other celebrities who made an appearance thrilled the sold out crowd with captivating musical performances. The show started with awesome performances from the likes of Burna boy who rocked the crowd with hit songs Ye & Gbona. Starboy Wizkid also made an appearance in support of his long time friend Wande Coal. 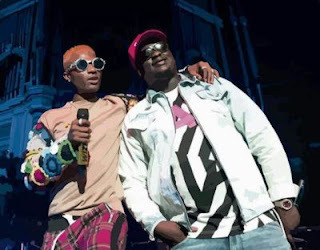 0 Response to "Wande Coal Shuts Down His Sold Out Show As Wizkid Makes An Appearance"